Hello Welcome to In the Moment with your TMJ! In the Moment with your Temporo-Mandibular Joint! If you do not know what the TMJ is, you are lucky, because it probably means you've never had a problem with it. Your TMJ is the joint in your cheeks, where the cheek bone, or temporal bone of the skull meets the jaw bone, or mandible. It is easy to locate. Put your hands on each cheek, and simulate the chewing motion. It is where the jaw meets the cheek bone. Just over this joint is the masseter muscle, that is responsible for chewing. Lots of people hold stress in this area, when they clench their jaw or grind their teeth. There is a conversation on my Ask-a-Nurse webpage, discussing this issue, here. Often you can see people flex their cheek muscles, the masseter, in response to stress. 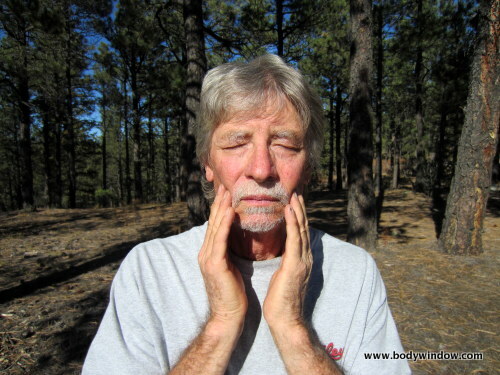 One has to clench and unclench the jaw at the TMJ to make this movement happen. I am amazed how certain people look totally calm on their faces, yet I see their masseter muscles flexing. When I see this, I know they are holding something in, as they clench their jaw! Problems with the TMJ can also be due to accidents involving whiplash or other facial injuries as well, and perhaps arthritis is a cause if this joint is affected. However, there is a strong emotional component to the temporomandibular joint. If you become more aware of how you hold stress in your face you will hopefully never have a problem with this joint. I am certainly becoming more aware of my own TMJ. I recently went to the dentist, and found out that I had an upper left molar that was chipped, and a lower left molar that was in need of a crown, due to problems with a large old filling. I had gone into the dentist because the lower left molar was hurting when I bit down, but I didn't even notice the upper molar! My kind dentist politely informed me that I had a "strong bite" and this was likely the cause of these problems. He asked me if I ground my teeth or knew I was clenching my jaw. Well, this was a surprise, because I had no conscious awareness of either of these! He denied, when I asked, if this could have happened with regular chewing. Just when you think you have something learned pretty well, life wants to throw something else at you, to further the lesson. Isn't this always so? Well, I was humbled to say the least. I was a practiced yogini and knew all about the body-mind connection! I was supposed to know how to totally elicit the relaxation response in my body. I still do know this, however, a small pocket remains. Well, I told the dentist that I would add jaw relaxing exercises to my yoga practice! And so, I developed this Body Moment to help all of us learn to be more aware of our jaws. The emotional and energy center of the mouth is 5th Chakra energy, and I have certainly had my share of issues with this area. (Click here to read about). Come to a comfortable seated position. Take several slow breaths, deepening them with each breath, as you bring your awareness here. Straighten your spine and elongate your neck as your crown reaches up to the heavens. Keep breathing deeply as you feel energy grounding down through your sitting bones AND you feel energy rising up and out your head. Close your eyes. Now, bring your attention to your jaw. Were you clenching? If so, relax and drop your jaw. If you need to open your mouth slightly to feel this relaxation, go ahead and do so. If you choose to keep your lips open, place your tongue on the roof of your mouth to keep you breathing through your nose. The breath that travels through the nose is fuller and more energizing. Once you believe that you are fully relaxing your head, neck and jaw, take the tips of your fingers and gently massage your temporomandibular joint. Your jaw may drop farther as you do this. Allow this to happen as you fully relax and release your jaw. Continue to breath through your nose, keeping your tongue at the roof of your mouth. Breathe slowly and deeply at least 10 full breaths. You may drop your hands if you can keep the relaxed state without them. Slowly bring your attention back to the outside world and open your eyes. You may repeat this exercise if you desire. Do this several times during your day, especially if you work a lot on the computer. We tend to really grip with our body when we are doing focused work on the computer. If you do this during your work day, you may find that your stress abates considerably! I release my jaw from stress! I release my attachments to my emotions! I release my attachments to my beliefs! I release my grip on all things in my life! I unclench my jaw and I am free! I accept all things just as they are! I release my need to control all things! I place myself in God/the Universe's hands! Feel free to create your own affirmations that have meaning for you, as your heart is lead to your own specific issues with the TMJ. Make them meaningful to you! May you always breathe and ungrip and unclench your jaw as you go forward in your life!